CARSTAR franchise partners, vendors and insurance leaders from both the U.S. and Canada came together at the annual CARSTAR Momentum North American conference and raised an astonishing $230,000 for cystic fibrosis research, care and advocacy. The annual CARSTAR cystic fibrosis fundraising target for 2018 was $375,000. Thanks to the CARSTAR Momentum 2018 conference, the network shattered its goal. The current total for funds raised is now at $470,000 with additional events still yet to happen. The passion behind this cause has never had more momentum and the CARSTAR network plans to keep it going for next year’s conference in Chicago, IL. To honor this achievement, the Honorable Vi Lyles, Mayor of Charlotte, NC, and the Honorable Fred Eisenberger, Mayor of Hamilton, ON, issued letters of recognition to CARSTAR for its ongoing efforts to raise funds for cystic fibrosis research, care and advocacy, both at CARSTAR Conference, during its annual Shine Month events and through activities over the past two decades. 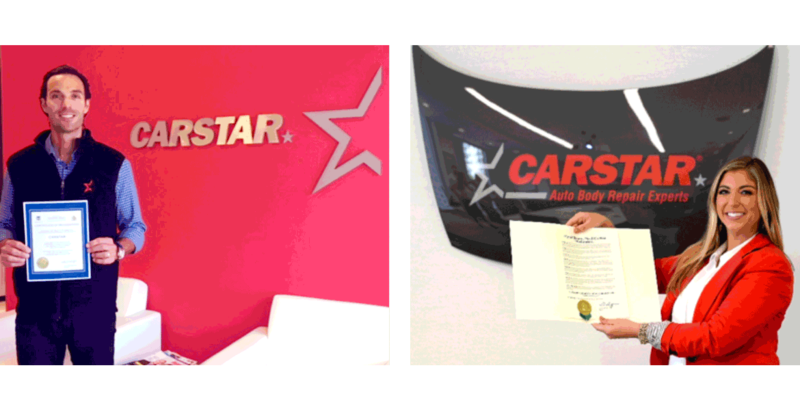 Pictured at top: Michael Macaluso, president of CARSTAR, and Hannah Ross, director of marketing for CARSTAR, with the Hamilton, ON, and Charlotte, NC, letters of recognition. For more information on CARSTAR, visit CARSTAR.com or CARSTAR.ca.